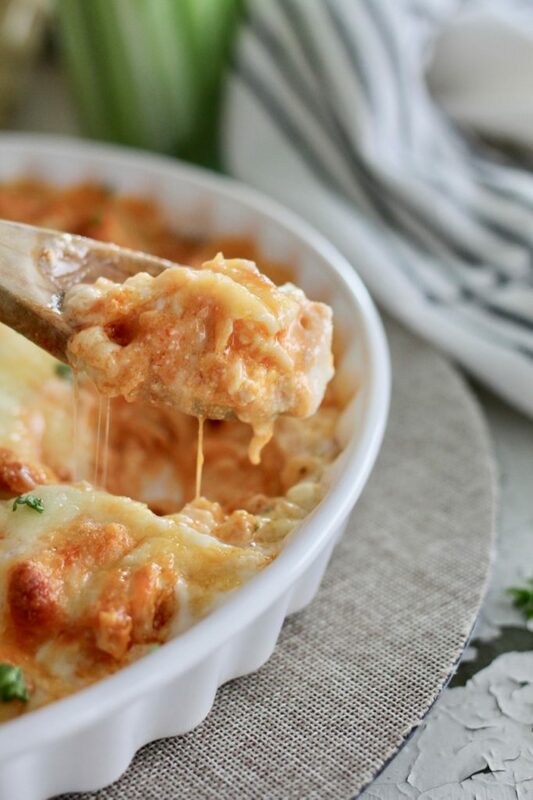 Buffalo wing dip is a game day FAVORITE! All the flavors of buffalo chicken wings, but without the sticky hands. This easy appetizer is every wing fan’s dream come true! It brings all the tastes and flavors of buffalo chicken wings to life in one easy appetizer dish. Try this appetizer for the Super Bowl or any game day! 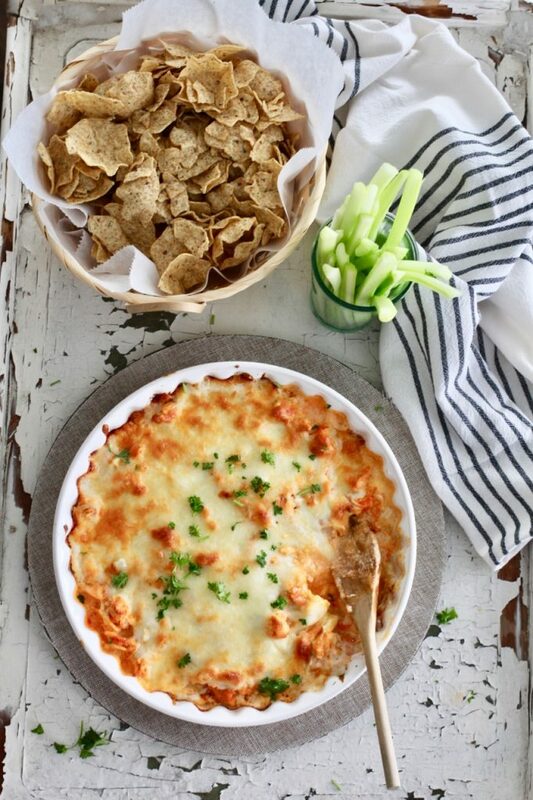 You’ll be everyone’s favorite team member for making this tasty dip. If you need something quick and easy, this is your recipe! You’re going to need about 2 chicken breasts that are cooked and chopped. OR you can just pull apart a rotisserie chicken to make it even easier. Spread the softened cream cheese in a 9×13 o large round dish that is oven proof. Letting the cream cheese sit on the counter for about an hour makes this easy, or use the microwave to soften it up a bit. The rest of the recipe is simply mix, dump and drizzle. After the dip is assembled, place the pan into the oven and bake. When it’s done it will be bubbly, hot, and cheesy. 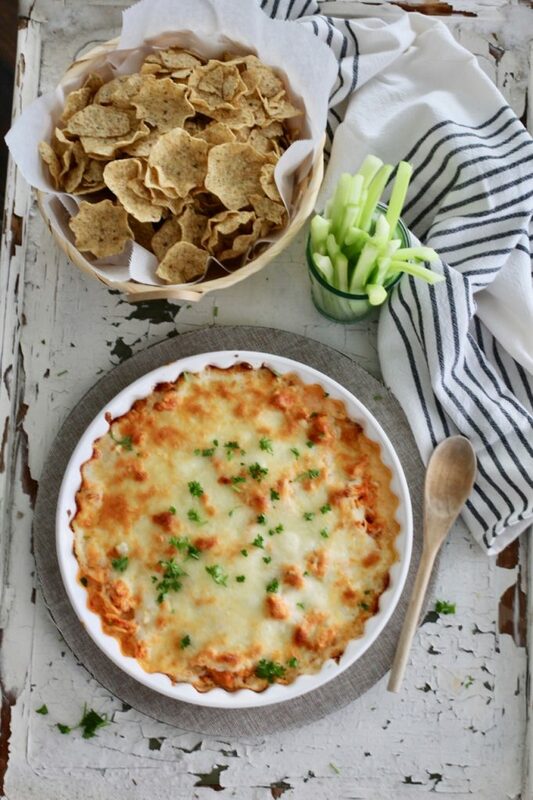 Serve this spicy dip with your favorite tortilla chips! Or if you want to cool down the heat a little, we love it with crispy celery sticks (I like to slice mine long and thin). Feel free to make this ahead of time too- just prepare everything and bake on game day right before you’re ready to serve. This dish is definitely best eaten immediately out of the oven. Preheat oven to 375 and set rack in upper third of oven. Spread the cream cheese in a 9 x 13 pan or a 10 inch round pan. 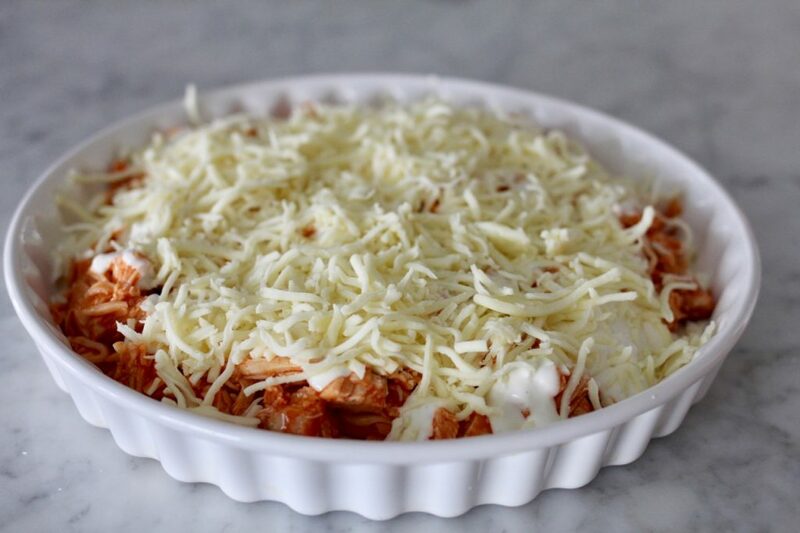 In a bowl combine chopped chicken, hot sauce and 1 cup of the cheddar and 1/2 cup mozzarella cheese. Reserve remaining mozzaarella for top. Dump the chicken and cheese mixture over the cream cheese. Drizzle the Blue Cheese dressing over top. 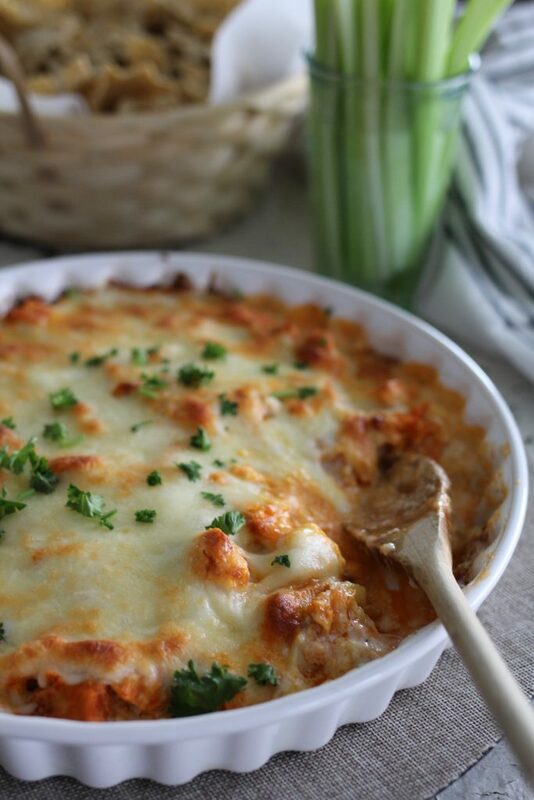 Top with remaining 1 1/2 cups grated mozzarella. Serve immediately with tortilla chips and celery slices. - I spread this into two 9 inch round baking dishes.-I used about 1/2 bottle of the Blue Cheese dressing.In the photo above, we drizzled the dressing over the top of the baked dish and sprinkled with a little blue cheese. -This recipe is also easily halved or made ahead. If making ahead, Layer all ingredients in a pan, and refrigerate until ready to bake up to three days before serving. On day of serving, remove from oven, let sit on counter top for an hour. Bake as directed. Serve while hot. 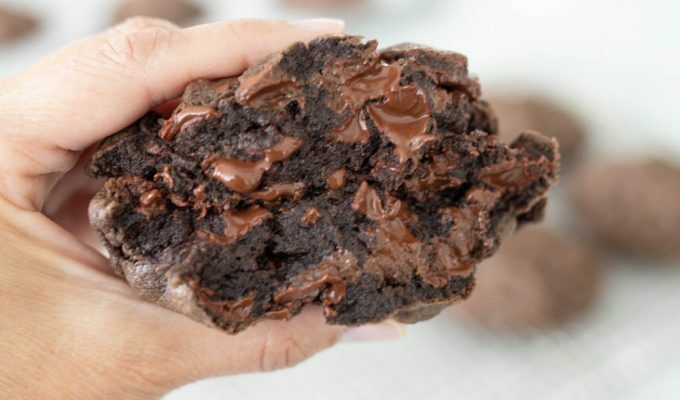 This looks super yummy. Do you think I could substitute Ranch for Blue Cheese.? I am just not a fan of blue cheese but I love buffalo anything.